In 1972, Connersville began a great legacy by defeating Gary West Side in the state championship by seventeen points. Then, in 1983, the Spartans were once again victorious and given the state title against Anderson. Since, our community has been united by Spartan basketball. Concluding the current season, we must say goodbye to two talented, hard working seniors who have had a tremendous impact on the court and established a brotherhood with all of their teammates. Noah Belt has grown from a freshman to a senior, each year on the Varsity platform. Through constant practice and repetition, Belt has been able to perform at a higher level and exceed all expectations. “I believe Noah’s greatest qualities are his love of the game, self-discipline and inner desire to succeed. Noah is consumed with the game and is a gym rat! He is confident on the court due to the hours of practice and repetitions that he has put in. He has a strong drive to succeed and win,” Brown stated. Belt believes that the memories he has been blessed to be a part of is worth the blood, sweat, and tears invested. “My favorite memory is winning the sectional at New Castle my sophomore year. The crown support we had was amazing,” Belt says. 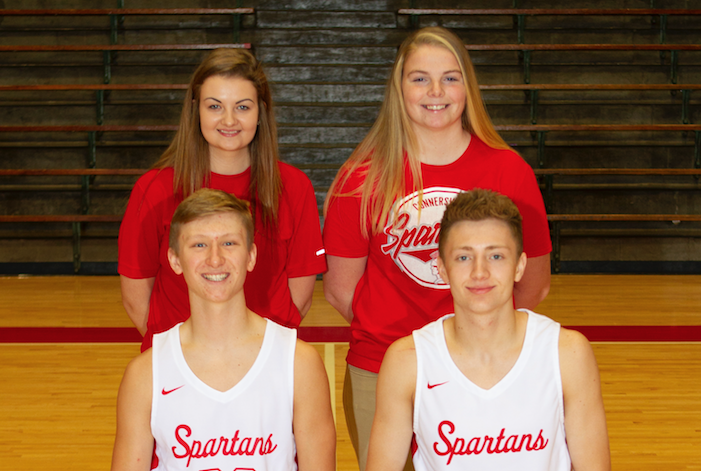 Though his time as a Spartan is coming to an end, the lessons that basketball has taught him will remain with him through the entirety of his life. Together, Logan and Belt have created a path that Brown hopes each underclassman will soon follow. Brown commends them because they have, “helped foster the ‘buddy system’ where the older players help guide and bring along the younger players and teach them how to do things the ‘Spartan way.’” After four outstanding years from Logan, he has concluded that he will mostly miss “all the little kids looking up to you because it really makes you feel good to know you’re a role model for little kids.” Similarly, Belt said, “I will miss playing in front of my hometown crowd in the Spartan bowl. Nothing compares to it.” In an effort to show his gratitude, Belt would like to say “thank you for making me a better basketball player and most importantly a better person.” Though it may be goodbye, their contributions and efforts to the program will never be forgotten.